I woke up and found my best chess set. It took me an hour. I watched a T.V. Show with Adrian. Next, I saw Twin Glacire. One kept breaking off. They were fabulous.. After that, I played a few card games with a group of kids. 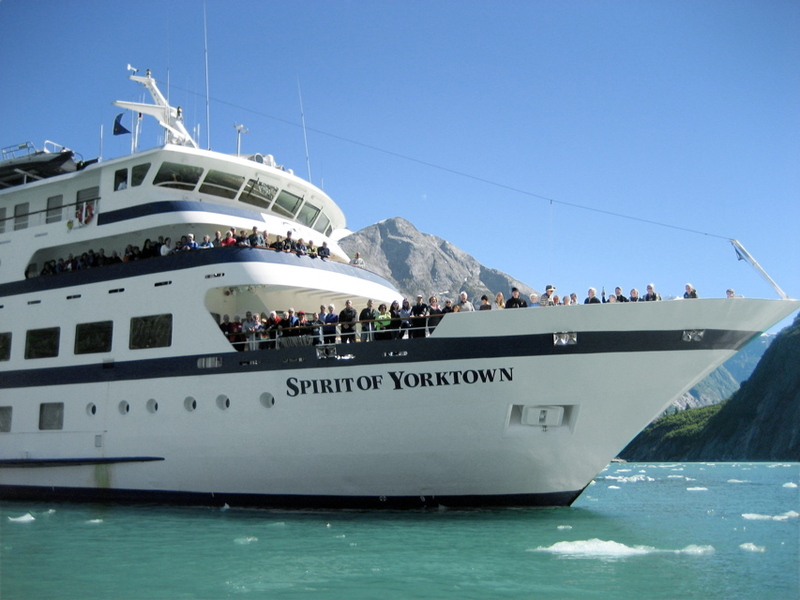 We woke up while the Yorktown was at the entrance to Tracy Arms. As we went up the Sawyer channel we saw more and more small icebergs ("burgie bits" and "growlers") and then we came to the South Sawyer Glacier. We didn't get as close as we did with the Le Conte Glacier, but we still had some beautiful views of the calving glacier and its icebergs. We also saw a beautiful white mountain goat! And we saw some harbor seals, lots of "bachelor" Steller sea lions, and lots and lots of icebergs. We also passed lots of waterfalls with thin white streams racing and falling down the steep cliffs. One of the waterfalls is called "Hole-In-The-Wall" because the falling water has gouged out a hole in the cliff face. Then the waterfall deposited a few small rocks in the small hole. The action of the waterfall caused the rocks to grind around and around the hole, smoothing and enlarging the hole until it is now an almost perfect big shallow circle. I woke up, and went kayaking by myself. It was so fun. I went in a double canoe with Nathan. We padled everywhere. We weren’t aloud to beach, but we circled lots and lots of islands. The ocean was rough. We had to tackle the waves. One boat wave crashed into us. A float plane buzzed over us. We tried to spash it, but missed, though it made Mike, the tour guide, start a water fight. Everyone got wet. It was so sunny and hot, that it actually felt nice. I found 3 crabs, 2 of which we picked u. The third one was a ft. long, so I couldn’t pick it up. Some King crabs are 5 ft. Imagine picking one of those up, or not relizing it on you and pinching you. I picked up some kelp and when I lifted it, there were a lot of Ice worms. I was really, really scared at first, but once Mike showed that there just fun to flick off, it was a blast. Flicking one off, so I flick another off, and some more. Soon I plucked every single one off. I was way too tired for everything exept cards, and a very long sleep righ after a resting long dinner. This morning we steamed through a narrow passage to Sitka. Natan went on a sea-kayak tour while Arthur and I went on a walking tour of historic Sitka, which was led by Jane. Sitka was a town of Tlingit people with several Tlingit clans that battled each other for power. Then in came the Russians, the fur traders, who treated all the Tlingits and Haidas horribly. 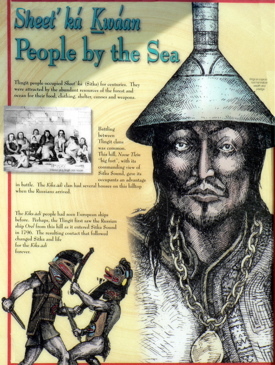 There were two major battles between the Tlingits and the Russians. 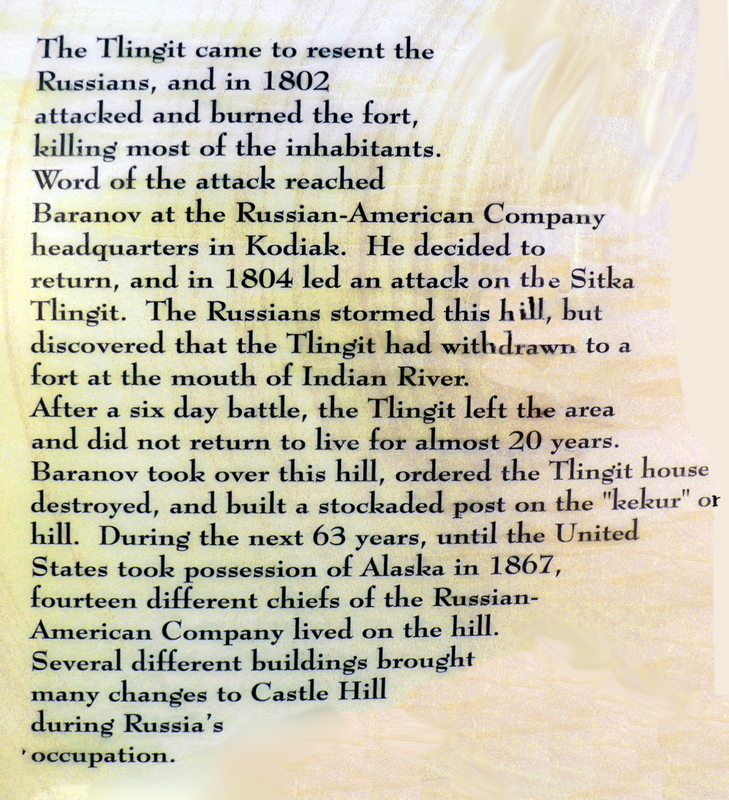 In the second, the Russians bombarded the Tlingit fort for days without breaking into the fort. But then the Tlingits removed their ammunition and supplies at night and left the fort. The Russians burned it to the ground, and burned all the Tlingit village homes, and began their long rule of Alaska, using Sitka as their capitol. In 1857 the US bought Alaska from the Russians for $7.2 million ($200,000 was for the amount owed on the small Sitka lake.) The deal was termed Seward's Folly or Seward's Icebox, until gold was discovered in Alaska. after Alaska was sold to the US, most of the Russians pulled up stakes and left. Now the population is about 70% European background, about 30% Tlingit, and only about 1% Russian descent. We met Natan back at the boat. He LOVED his kayak trip! But he decided to stay on board while we took the tour of the Heritage Center in the afternoon. At the Heritage Center there was a wonderful totem park, and there were craftspeople at the center that we could watch. We also saw an eagle's nest with a nestling in it outside the center! David gave us a talk about the plants of the region. Alder is a pioneer species because it can fix its own nitrogen. The cambium layer of the bark was used by the Tlingits to make a medicinal tea. Willow leaves are great for vitamin C. The inner bark has a natural salycin (aspirin). Yarrow: a poultice of yarrow was used to prevent wound infection. It was also rubbed on the body to cure baldness and to fend off mosquitoes. A yarrow tea was used as a hangover cure. Cows Parsnip (wild celery) has big flat rafts of flowers. The stems were burned and rubbed on teeth to cure toothache. Skunk Cabbage has huge leaves. The Tlingit shaman would roast the seedpods for hallucinating before a big hunt.